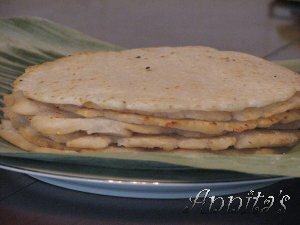 Orotti,which falls under traditional Kerala breakfasts category is a variety of thick roti made using rice flour and grated coconut.Some add jaggery,mashed banana,mashed jackfruits etc into the dough to make sweet orottis,but in my home we always prefer it to be plain and is often taken with spicy chutneys or gravies. Ghee or Oil – for greasing the pan. Take a bowl, add rice flour and grated coconut into it,mix them together.Boil water in a pan,adding required amount of salt into it.Pour the boiled water little by little to the rice flour,stirring in between,until it is ready to make into a smooth dough.Allow it to cool for a while.When it is half cooled,knead it with your hands into a smooth dough.Divide the dough into 4-5 equal sized balls. Heat the griddle and apply little ghee onto it.Take a ball and spread it like a thick roti onto the griddle using wet hands.Or else you can shape it into a roti on a banana leaf,a parchment paper,foil etc and transfer it into a greased griddle.Cook for about 1 minute on high heat,then simmer it for 3-4 minutes.Now turn the roti,and cook the other side the same way.Apply little ghee on top and serve hot. This can also be prepared on a banana leaf,spread the dough into the shape of a roti on a greased banana leaf and cover it with another piece of greased banana leaf,and then cook it over a hot tawa. This entry was posted on April 23, 2007 at 3:35 pm	and is filed under Bread & Rotis, Breakfast Dishes, Traditional Kerala Dishes. You can follow any responses to this entry through the RSS 2.0 feed. You can leave a response, or trackback from your own site. Would dried flaked unsweetened coconut work in this recipe, or must one grate fresh coconut? I have only heard about it. Thank you sooooo much! Not heard of the term “orotti” before!Looks good…will give it a try. Is this like Pathiri? I have heard this name but haven’t seen before.And that unda chammanthi is also new for me..have to learn much from you..
yet another favorite dish of mine. I love the orottis that my amma makes.. hhmmm am missing home :(. I am a regular to your blog since the last two years and it really the best blog on Naadan cuisine so far. 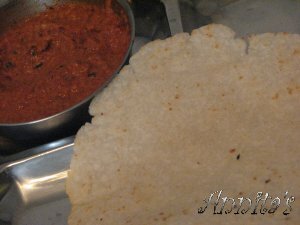 Orotti is something that really made me write this coz this was the way my Ammoomma used to make it…Plain and with Dry red chilly chutney….the kind where it was burnt on coals then crushed with oil, water and shallots. On the side there also used to be kappa that was cooked in hot coals. Thanks for sharing the recipe. Keep up the good work. Thanks fopr your kind words,Nisha..I’m so happy to hear it..
nice Akki roti! Great so many similar recipes, but we roll it on like pulkas. I have had this just once. I had no clue about it’s preparation. Thanks for posting this. Orotti looks delicious! Very simple recipe.Thanks for sharing dear. rava. Its easier and tastes good too. Just mix with salted water and grated coconut and keep for 5-10 min for the rava to get soaked. Rest is the same. a very tasty version of the orotti can be made this way. coarse grind two little shallots, little curry leaves and 2 greenchillies in a mixer and mix it well with the coconut before all these are mized in the flour. Rest remains the same. A liitle oil while cooking would meake it softer and long lasting. I’m sure this will taste great,Meena..will surely be trying this out. I have gone through your site and it is really amazing. This dish is really new to me. Which part of Kerala use this as a breakfast? I think its a Malabar speciality,but it is prepared all over Kerala.My amma’s house is at Kanjirapally..and they prepare it quite often,and again my husband is from TVM,and they make it too.. I think this recipe is very common in Kollam, especially among Ramzan specials. I started seeing it frequently after reaching my husband’s house in Kollam. Its substitute for Malabar pathiris there. My mother makes it like dosha dough and spreads on the pan.I will try this one. was looking for an easy to make breakfast recipe! Thanks for the recipe. The last time i had this was twenty years back in my mother’s house at tellicherry. However, the pictures posted look a bit different from what i had had. Ours used to be really thick – 1 to 1.5 cm thick. Also it used to be steamed first amd then pan fried. Best eaten with chcken stew or mutton curry. Orotti and chicken currey, it is one of the best combinations in Kasargod.The one in this photograph looks like Akki roti of Kanndiga’s,However real orotti is famous in kasargod Part of kerala, It looks similar to Pathiri.I have seen my mom preparing it like a poori( it will be a bit harder after sometime).Nannai pongi vaanthinu sesham,Orotti aduppinte theeyil oru 2ndu minute vachal ,orottikku nalla taste undakum.Orotti ee photoyil kanunnathu pole ithra thick aakan paadilla.Orottiyude akam pollayayirikkanamlike a poori. ( but thicker than poori. I am very thankful to you because when i asked a girl about its preparation, she was hesitated to say it.I promised that i will find it prepare it. Awsome…this is one of the dish which is going to extinct from Northern Kerala. 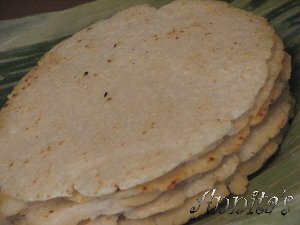 Hi, Is Orotti made of roasted rice flour or plain rice flour?